WalmartAs of Thursday afternoon, the pack was still available on Walmart’s website. A Twitter user posted a picture of a Cards Against Humanity expansion pack that targets Jewish people. The “Chosen People Pack” contains jokes that reference the Holocaust. Target has apologised for selling the pack. The pack was still available on Walmart’s website on Thursday afternoon. Cards Against Humanity, a card game where players answer fill-in-the-blank prompts with pre-written responses meant to shock and offend their fellow players, has come under fire for an expansion pack of cards that targets Jewish people. The “Chosen People Pack” contains prompts and responses that reference the Holocaust, including one response card that reads “Torturing Jews until they say they’re not Jews anymore.” The cards are sold as the “Jew Pack” on Cards Against Humanity’s website. 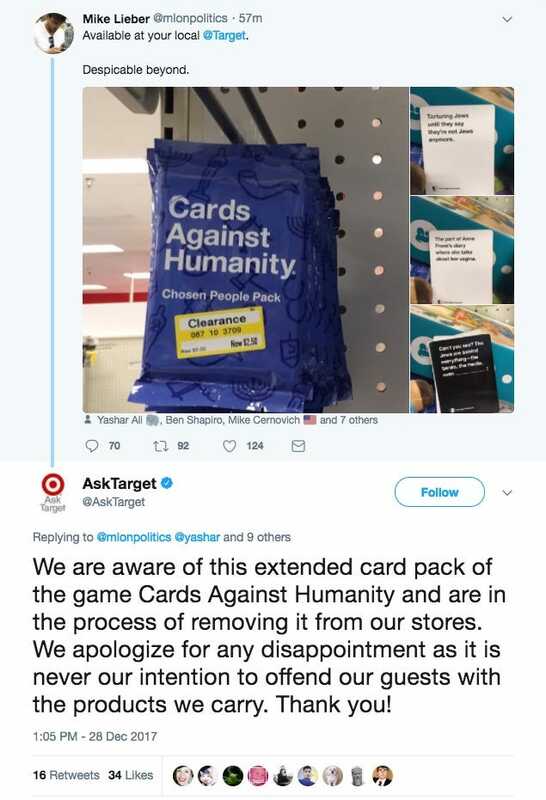 Target drew criticism for selling the cards after pictures of the expansion pack were posted on Twitter. “Available at your local Target. Despicable beyond,” the tweet by Mike Lieber read. Target’s guest service account replied to the tweet and apologised for carrying the product. Cards Against Humanity has previously drawn attention for unconventional marketing strategies, like purchasing land near the US-Mexico border to disrupt President Donald Trump’s proposed border wall and digging a hole for as long as customers would fund it. As of Thursday afternoon, the card pack was still available on Walmart’s website. 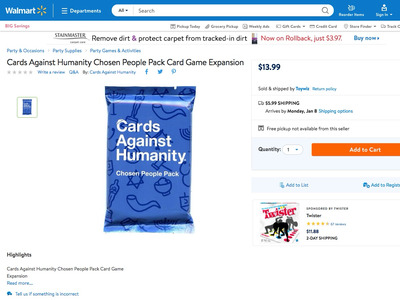 Cards Against Humanity and Walmart did not immediately respond to a request for comment.